This adorable cabin has been thrilling guests for years and now, with new owners and under new management, it's even better! The cabin has received a "face lift" with many new upgrades throughout including new kitchen appliances. Located in a Cherry Log, 5 minutes from Blue Ridge and only 12 minutes from Ellijay. Apple Creek is very private and conveniently located to everything! The views from the deck are absolutely beautiful and the screened in porch is a guest favorite. Apple Creek is a romantic, cozy log cabin with the warmth of wood throughout. The den has a gas log fireplace for those chilly mountain evenings and the 2 Queen bedrooms and 2 full baths makes this the perfect cabin for one or two couples or a small family. Because the cabin is privately situated and has stunning mountain views, it is no secret why this cabin has been so popular over the years. The large screened in porch overlooking the view along with the sounds of a nearby creek make this a great place to hang out with that special someone. Enjoy that 1st cup of morning coffee while the sun rises in the distance. And if you're ready to unwind after that long drive to the cabin, the hot tub on the lower deck provides the perfect place to do just that. 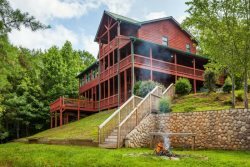 The location of this cabin is great, easy to access and only a couple of minutes from the main highway that leads to Blue Ridge which is about 10 minutes up the road and 10 minutes from Ellijay, just south of the cabin. Did we mention that this cabin is pet friendly? That's right, we want the whole family to enjoy their time in the mountains and Apple Creek is just waiting to delight you with it's southern charm! One stay here and we know you'll be back! Fully equipped kitchen: Refrigerator, stove, oven, microwave, dishwasher, toaster, crock pot, coffee maker, dishes, glassware, utensils, cutlery, pots, and pans. My experience was a great one. The only thing was remotely bad was the weather, but it raining most of the time kept us in the cabin that was so comfortable that it wasnt really a bad thing. PS the hot tub was incredible!! Cabin was great, love the blue ridge area. Its got everything and outdoorsman could want. The town has that nice old style easy going feel to it with friendly faces around every corner. Really enjoyed the cabin. There was so much to do at the cabin alone. It was a nice getaway. We stayed at Apple Creek Cabin in October. Great location, close to the town of Blue Ridge but away from the distraction of traffic and other people. You drive approximately a mile up a dirt road on to a mountain side where your closest neighbors is down the road out of site. While sitting on the porch or laying in bed, you can hear the Creek just down below. When you first open the front door, the sweet smell of wood and charming decor including hundreds of bears takes you back in time to a simpler life. We enjoyed sitting by the fire pit each night and soaking in the hot tub on the balcony in the morning. Having a gas fireplace downstairs allowed us to stay toasty when we sipped on drinks while playing cards or warm up after using the hot tub on a cool morning just outside the sliding glass door. Our dogs enjoyed laying next to the fireplace on the main level when they weren't basking in the sun on the enclosed porch. Being able to bring our dogs was an added bonus since there were so many trails to hike with them. Having a book of local brochures and recommendations helped us plan our day trips and we added a few more from interesting places we happened upon while driving. It was great having a grill to cook on and the kitchen was well stocked. We even made french toast from apple bread we purchased at Mercier Orchard. Highly recommend hiking the numerous trails leading to waterfalls, touring Granddaddy Mims moonshine distillery, and white water rafting on the Ocoee River. Overall magical cabin. It was an amazing experience and would recommend to everyone looking for a relaxing getaway in the mountains. Beautiful and cozy. Just what we needed. Very private and a wonderful place to get away from the stress of every day life. Easy to book, easy to pay and the cabin was just as advertised: charming and clean with beautiful views. We had a wonderful time. We had everything we needed and the place was beautiful. We will stay here again when we come back to Blue Ridge. Great stay! My wife and I regularly spend time in the mountains (we live in Florida on the water) but love the experience. This has been our favorite stay to date! The staff went out of their way to accommodate our needs! We really enjoyed staying at Apple Creek cabin! The view is absolutely amazing we couldnt get enough of it. The cabin was beautiful we were welcomed with a cute little Christmas tree and Christmas music being played on the tv. The house was nice and warm and cozy. Everything was clean and we really enjoyed all the board games! Beds were super comfy as well. We will definitely be coming back and hopefully staying in the same cabin! We loved the cozy comfort & beautiful views at Apple Creek Cabin. The fireplaces, porches & deck were especially relaxing!The fooseball table & board games were great fun too! Just what we were looking for! Our stay at Apple Creek was just perfect. We came up to escape the Florida heat and see some fall color. The cabin was well appointed and very cozy. The view out the back has to be one of the best we have seen. We really enjoyed Morning hikes on the roads leading to and from the cabin (the walking sticks were a nice touch). We cant wait to book our next stay! Thank you for sharing your piece of heaven with us!